... the attractive holiday card for friends of ADLER Spa Resorts and Lodges. 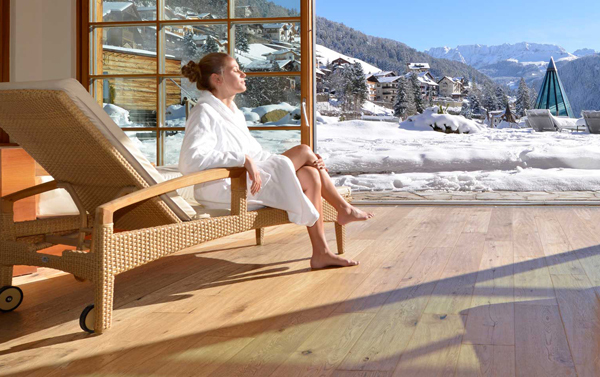 Ask for your ADLER Friends Card and your personal login for special offers on your next visit to one of the ADLER Spa Resorts and Lodges: ADLER Spa Resort DOLOMITI and ADLER Spa Resort BALANCE in Ortisei/Val Gardena, ADLER Spa Resort THERMAE in Tuscany or ADLER Lodge ALPE on Alpe di Siusi. We have created the ADLER Friends Card to mark ADLER's second centenary and to reward our guests for their loyality. For every holiday you take and for all the treatments and extra services you book, we will credit valuable ADLER bonus points to your personal ADLER Friends Card. You will find a range of attractive offers and vouchers that you can "spend" your ADLER bonus points on during your future holiday at all ADLER Spa Resorts and Lodges. Time off for the whole family. ADLER Friends Kids between 2 and 14 years stay free of charge during short stays from Sunday till Thursday. (Offer valid for children sharing a room with two adults). Furthermore we give you an ADLER body beauty kit as a present. Spend 4 enchanting autumnal days paying only for 3! With only 360 ADLER Friends points per person you can enjoy a Short Stay (4 nights) at the Weekend (3 nights) price. Complementary you will get an ADLER milk and hoeny shower cream. Unplug and free yourself from the daily stress. The time has come to regenerate and start again with the right energy.